I know I picked a good place when our taxi driver also decided to have his lunch here. He even gave me a nod of approval and said I picked a great place to eat — Score! I also know it’s a winner when after Daniel took his first bite he couldn’t stop dropping the “F” bomb and this guy rarely curses, unlike me, but he kept saying, “F this is so F-ing good, FFF!” What the heck are y’all eating you might be wondering and, from the above image, we are devouring Cơm tấm bì sườn chả trứng chiên. What is that? Well come and let me explain more below. Im pretty sure this is a rice dish…ha. This may not be the healthiest meal you’ll have, but it’ll be the heartiest and the most satisfying — Maybe you’ll drop some “F” bombs too. This store is super famous and totally lives up to the fame. We ordered the “everything” plate, but according to Daniel, this is the “F” plate — haha. They also serve other toppings like meatballs, Vietnamese red sausages, and fried chicken, but what we ordered is the most traditional plate and is what my mama used to make when I was growing up. The food arrived and I’m super surprised that the pork chop here is ginormous — even bigger than what Vietnamese restaurants in America serve. 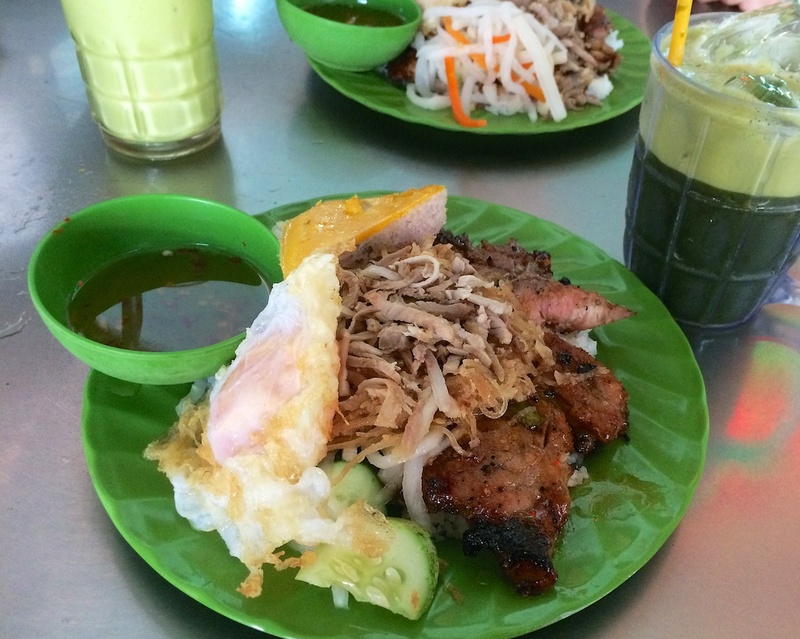 The pork chop is basically like the main dish while the rice and egg is the garnish. Don’t worry though, everything on the plate balances out very well and each part plays a distinct role in the dish. This is how I like to eat this dish: First, I like to mix the shredded pork, meatloaf, fried egg, and the pickled vegetables all together so the runny yolk from the fried egg coats everything. I just want to ensure each bite contains every bits of goodness and I like the different texture in each bite. Next, I suggest adding in a little bit of fish sauce at a time to adjust to your liking, but Daniel poured the whole bowl in — He can literally drink fish sauce like it’s water. Finally, I take a bite of the pork chop and a spoon full of the “everything” concoction I just created and the result is fireworks in my mouth! 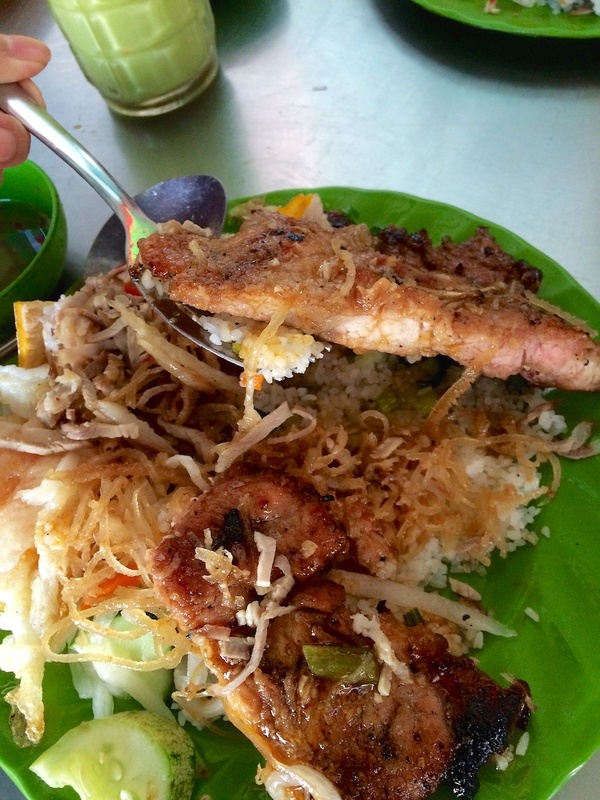 If this is too much meat for you, opt for just the pork chop rice plate (Cơm Tấm Sườn). 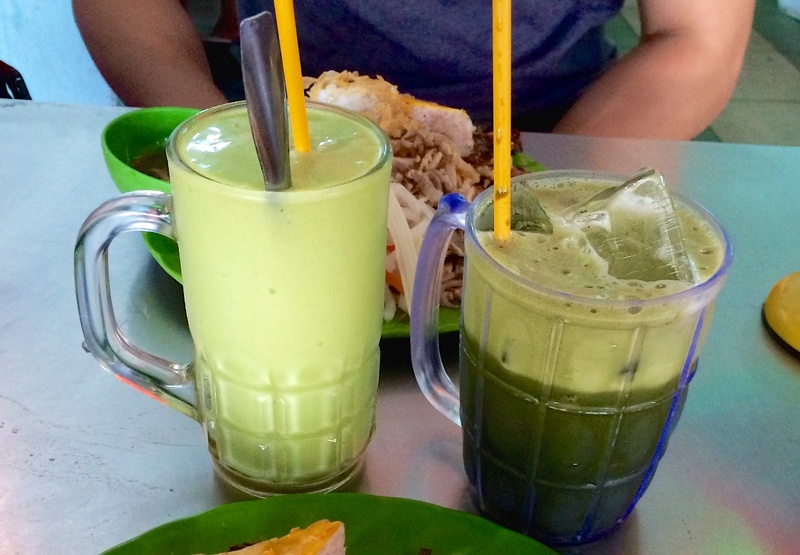 Also, we ordered 2 drinks: avocado shake (Sinh Tố Bơ) and pennyworth drink (Rau Má). If you are not familiar with these 2 drinks, here’s a quick description. Avocado smoothie made up of avocado, condensed milk, and ice. 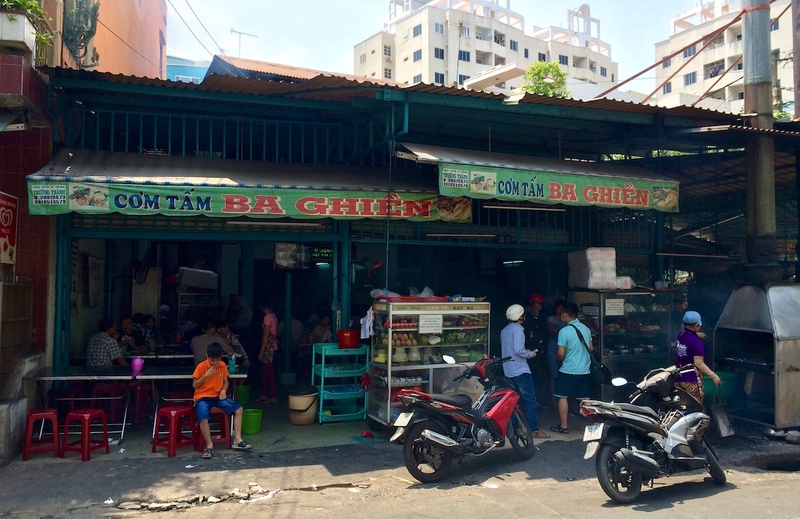 The flavor is light yet rich and yup, you’ve guessed it, Vietnamese people drink avocado — They don’t serve avocado in savory dishes like most Westerners. Pennyworth is a type of plant and can be cooked in soups or juiced for drinks. It’s bitter, but they are served lightly sweetened in drinks. The only thing I can think of that is comparable to the taste is wheat grass juice. Like wheat grass, it has many benefits like cooling and cleansing properties. Basically, it taste like grass — refreshing grass. 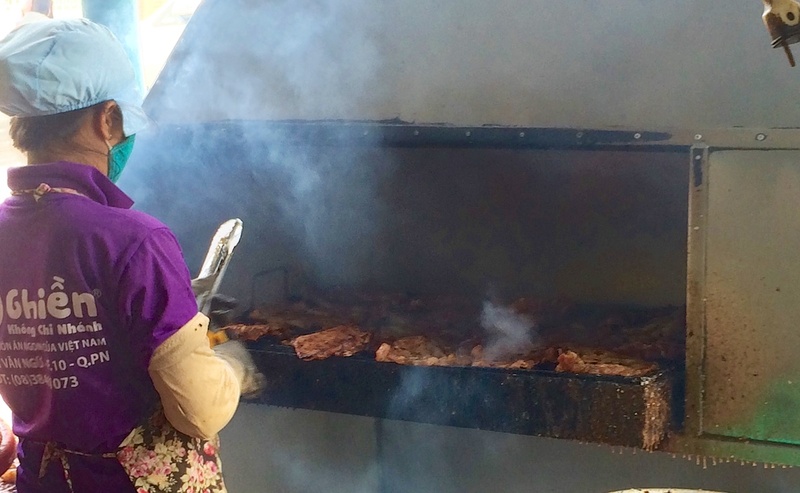 Just give it try to see if you like it, at least it can help cleanse the pork galore you just shoved down your belly. Here, they don’t have a menu and I asked the waiter how will foreigners know what to order if they don’t have one and she said they usually just speak English — haha. There you go, just point and usually that will get the job done or show them this post and they will know what to bring you.